I’m wearing this as I write. I woke up this morning with a craving for it. It rises off my wrists like smoke. Pungent and druggy, I adore the black earthy rub of rose and patchouli (more patchouli I guess, but it loves the rose to death…). Melancholy and mulchy, like drops of fairytale blood split in an enchanted garden. It has a burnt electrified aroma as it seeps into the skin. Like waking one morning to find your rose garden has been savaged by an electrical storm, leaves and petals torn asunder, crushed to the ground. The air still feels dangerous, alive somehow, perfumed with green sweet power. You kneel down and push your hands into the mix of leaves, shattered petals and wet earth. This is Voleur Des Roses. Created in 1999 by Michel Almairac for L’Artisan Parfumeur, this wild and pungent scent packs quite a punch. The rose & patchouli accord seems commonplace now, but Voleur des Roses still dazzles. The sillage is painterly, a cloak of autumnal plum and bruise coloured leaves dragging softly behind, occasionally picked up and lashed by a passing breeze. 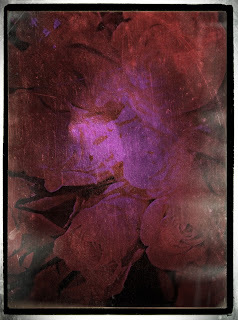 As you look around the savaged garden, still inhaling the electrified air, it easy to imagine the vengeful storm tearing through the roses, shredding leaves and petals in glee, pulling electrical charges from the sky and scorching the earth and shaken roses just for the sheer joy of it. This drama embeds in the scent. The truffly almost bitter chocolate note that rises from the plunging drydown. There is darkness. Like a finding a dead robin amid the leaves, redbreast glowing poignantly against the cigar tones of autumn. I love the shiver of darkness in Voleur, the trembling sense of something wrong. It is a very strange fragrance. Classified as a masculine scent, but troublingly feminine too. A questioning of tone and emotion that makes it so exciting to wear and smell on others. Almairac’s ability to conjure up atmosphere is magical. His new heritage leather floral for Bottega is divine. Gucci Rush (1999) still thrills me into sticky, naughty dreams of neon-scented weaponry. His Ambrette 9 (2006) for Le Labo is simply staggering. You literally need to sit down after you’ve tried it, it’s that intoxicating. I have worn his Fire Island (Bond No 9, 2006) for a while now. It continually amazes me every time I wear it, how succulent the suntan lotion note is, how golden and how heroic it is. How close the composition is to standing with my eyes closed on a Brittany beach, sun dappling over my eyelids, listening to waves and the crack of windsurfers. Almairac was also the creator of one my other more sentimental favourites: Minotaure, by Paloma Picasso. Dating back to 1992, a wonderfully atmospheric blend of citrus, jasmine and sweet leather. I was probably too young at 19 to be gadding about in such a ambiguous scent. But I remember clubbing to death in it, long floppy hair, slutty eyed and drugged up moves. God it smelt good on fired up skin. I haven’t smelt it in years. I’m not sure I want to. Sometimes, certain memories are better left untouched. Voleur des Roses may be nearly 20 years old, but sitting here with both wrists blooded with patchouli, rose and plum I realise it’s a masterpiece of counterpointing. Like swirling the lees of an aged burgundy in a warmed glass by the glow of a winter fire as snow and rain rage in the corner of the room. Romance meets brutality. Caress meets abduction. Kiss and strike. Quite the contrary rose.